The Find LTPP Sections feature allows users to narrow their search to the test sections that correspond to their interest. This year’s release includes a new filter that allows users to select pavement sections that have received specific treatment types, such as chip seal or overlay. The Data Selector feature has been enhanced with a new Data Availability option that shows the amount and range of available data for the selected subset of LTPP test sections. Also, the Table Navigator tool has been enhanced to give users the ability to navigate the LTPP data dictionary. The new Virtual Section feature, under the Data Visualization hub, allows users to visualize LTPP test sections in three dimensions, showing layer information, core locations used for materials sampling, and the location of nondestructive monitoring tests across the section length. The Analysis hub provides multiple features for preliminary data analysis. The Analytical Reports feature allows users to select specific data attributes and visualize them on various types of charts. Users can now export graphs and data shown on the Analytical Reports to an Excel spreadsheet. The new LTPP Climate Tool, under the Data hub, provides an interface to explore and extract the National Aeronautics and Space Administration’s (NASA) Modern-Era Retrospective Analysis for Research and Applications (MERRA) data. The Map module on this tool allows users to select the desired data geographically, while the Data module provides the climate data in a tabulated format for download. The LTPPBind Online feature is a web-based tool for selecting asphalt binder performance grades. In addition to high and low temperature performance grade, users can compare selected binder performance grades between the previous American Association of State Highway and Transportation Officials (AASHTO) M320-10 and modern AASHTO M332-14 standards. Users can select the required climatic data from MERRA, LTPP automated or virtual weather stations, or enter data manually. 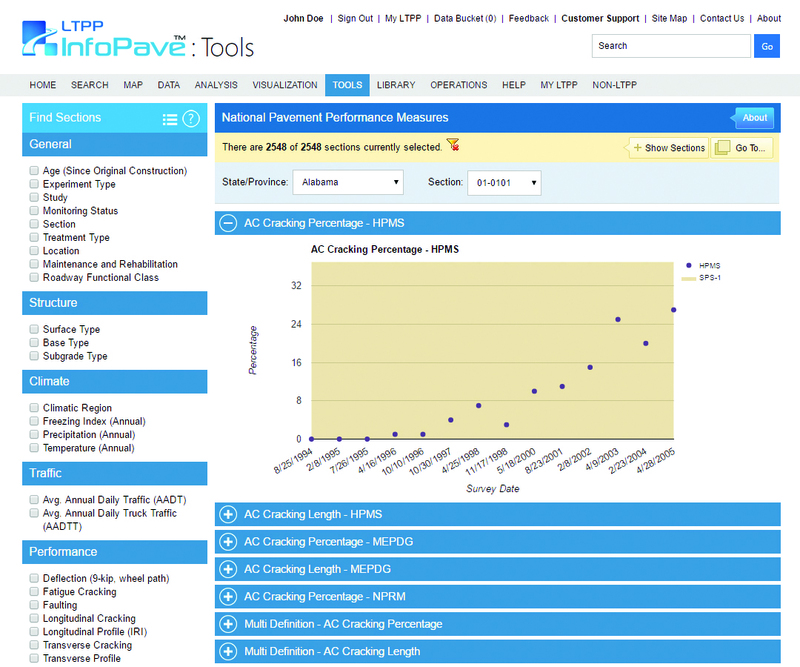 This new web-based tool displays the calculated national pavement performance measures based on LTPP data. This feature includes the pavement performance measures compatible with the Federal Highway Administration (FHWA) Highway Performance Management System, and the FHWA Notice of Proposed Rule Making for the Moving Ahead for Progress in the 21st Century (MAP-21) Act and the Fixing America’s Surface Transportation (FAST) Act. 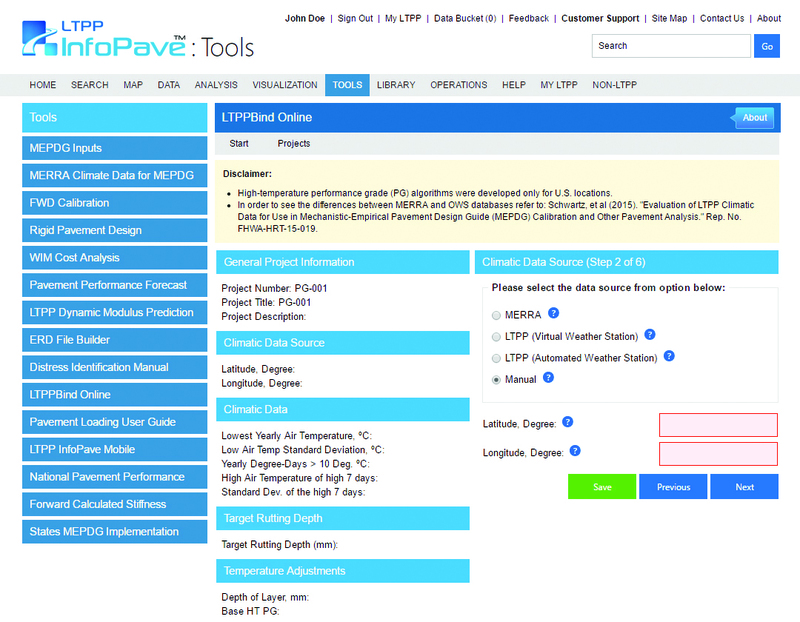 This web-based tool uses forward calculation spreadsheets developed as part of an LTPP analysis project to estimate the stiffness of the asphalt concrete or portland cement concrete surface layer and the subgrade soils based on user input falling weight deflectometer deflection data. The non-LTPP hub provides access to data sources other than LTPP that can be used in pavement engineering and research. The data and reports from the FHWA Rigid Pavement Performance and Rehabilitation program is the most recent non-LTPP data available for users to explore and extract. The new Advanced Visualization feature on Visualization hub allows a user to view desired InfoPave features in the same browser so that they can look at various features side by side. For example, a user can look at the Section Summary Report and the corresponding Cross-Section Viewer at the same time. The Web-centric interface for the LTPP Information Management System (IMS) provides a powerful and flexible tool that enables users of all levels—professionals, researchers, and students—to view, visualize, extract, and employ LTPP data. The LTPP program was initiated in 1987 to satisfy a wide range of pavement information needs. Over the years, the program has accumulated a vast repository of research quality data, extensive documentation, and related tools, which compose LTPP’s comprehensive IMS. The LTPP IMS is comprised of two major components, the Pavement Performance Database (PPDB) and the Ancillary Information Management System (AIMS). The PPDB contains comprehensive data collected throughout the life of pavement sections. AIMS is a central electronic repository that contains information such as raw data, images, reference materials, resource documents, and other facts that support and extend the data stored in the PPDB. In addition, the LTPP program maintains a comprehensive reference library with more than 1,200 research reports, tech briefs, and program documents in electronic format that explain how data are collected, processed, and stored. The LTPP IMS is the premier product of the LTPP program and will be used for research, pavement design, and product development for decades to come. The data and information in the LTPP IMS were made available online through the data portal system, LTPP InfoPave™, in January 2014. InfoPave is the public gateway to access data and other information about the LTPP program. By using the latest methodologies in computer technology, this Web-centric interface is designed to improve access to LTPP data. In addition to providing access to LTPP data, the interface also provides information, education, and tools to maximize the use of available data. LTPP InfoPave includes creative tools for data viewing, identification, and selection that helps users create their own personalized data sets, summary reports, queries, and much more. It gives users the ability to share data selections, views, or queries with other users, which can exponentially improve LTPP data usage across geographic boundaries and time zones. 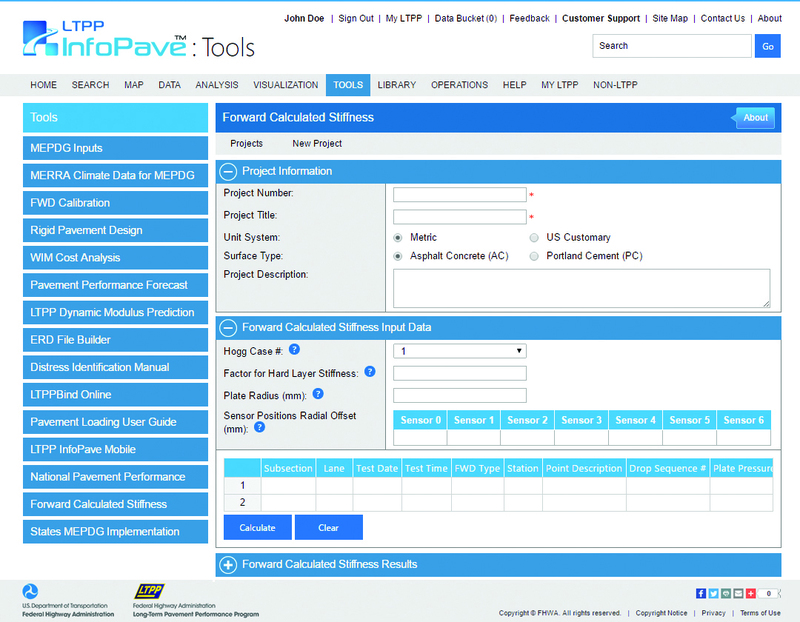 With LTPP InfoPave, LTPP data are at users’ fingertips, allowing them to obtain the right data efficiently and extract practical information regarding pavement engineering and management. For more information about LTPP InfoPave or the LTPP program, contact the LTPP Customer Support Service Center at 202-493-3035 or ltppinfo@dot.gov. 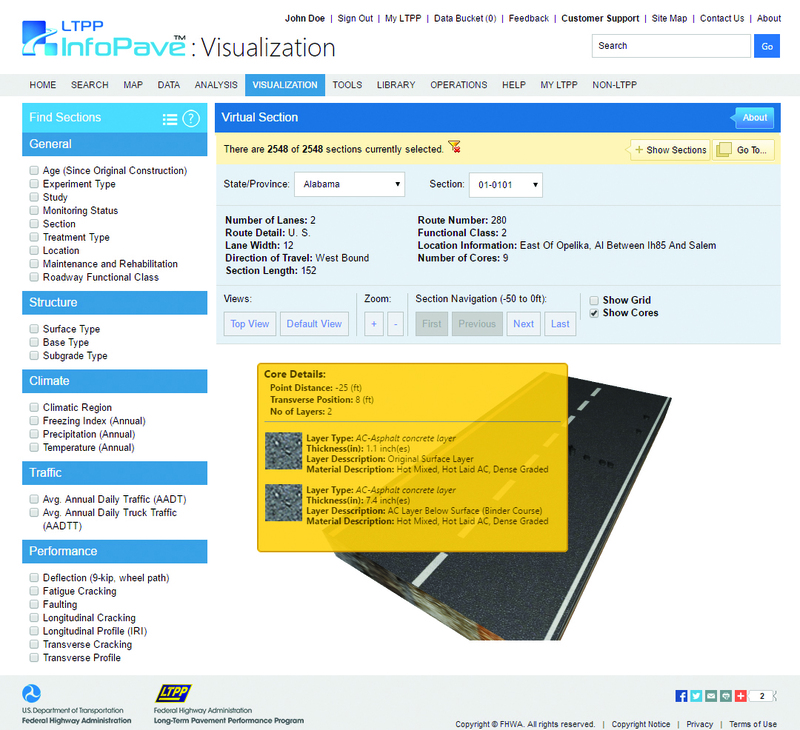 LTPP InfoPave can be accessed at https://infopave.fhwa.dot.gov.